Dogleg Bench 1 and 2. 19x17x60 inches. I found two bookmatched slabs of English Walnut, wane edged and rough but very pretty. 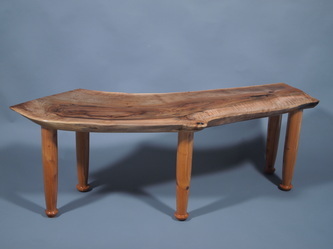 They became a pair of benches with legs of yew, carved on #1 and turned on #2. The tops were polished without flattening to maintain some twist and an undulating surface from the drying process. Both sold.